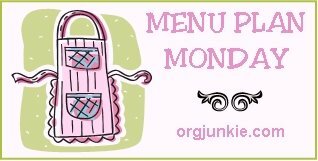 I'm back on track with my menus for Menu Plan Monday, although I forgot to plan around a family birthday dinner on Friday and a birthday party on Saturday. Those were two dinners I didn't have to make, so I incorporated them into this week's menu. Rob ended up cooking a turkey on the grill, so we have quite a bit of leftover turkey. I'm making a double batch of turkey tetrazzini this week, one to freeze.